With about 20 participants per group run (and hundreds participating in the Facebook group fodder), H Street Runners meets two-to-three times a month with most runs culminating in drinks or brunch at nearby venues. 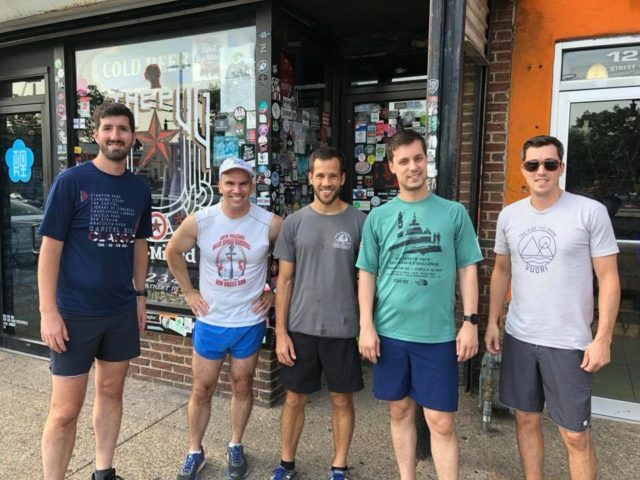 The social element, combined with supporting a bar or business is paramount to another one of H Street’s running groups, the Argonaut Running Club — where “every run is a happy hour and a beer run,” said founder and president Ariel Laguilles. It meets every Friday at 6 p.m. and about a dozen of its participants run about three miles before ending at a H Street watering hole for discounted drinks. The Argonaut, once located at 1433 H St. NE, is no longer in business — yet the group lives on after its namesake shuttered in 2016. After The Argonaut closed, the running group made The Liberty Tree its spot until that business closed in 2017. The Pug, 1234 H St. NE, is now home base. “The joke became ‘which bar are we going to close next? '” Laguilles said. Another H Street staple, The Big Board — 421 H St. NE — boasts a group all its own: Big Board Runners. Founder Andy Oetman calls the group of about 15 runners a “boutique running club” that is really all about friends, low-pressure running and grabbing a few beers or food at a favorite spot. “Big Board is a good starting point, and a great place to meet up afterward because no one cares if you stroll in in a T-Shirt,” he said. The Big Board offers discounts for running group participants. The group meets every Wednesday at the restaurant/bar (6:30 p.m. in the winter, 7 p.m. in the summer) and runs a few miles at a relatively leisurely pace, said Big Board Runners participant Kate Brogan. “[The running group] is really all about friendship. This is a close neighborhood, and this is a nice way to build a community here. These are the people who we go tubing with, and go to parties with and dog sit for,” Brogan said. Members of the Big Board Running Club show off their medals. 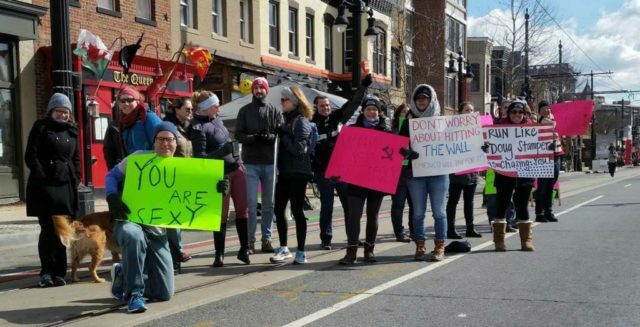 H Street’s running groups largely operate independently, yet a friendly rivalry brings them together every year. The H Street Cup is a competition that “tries to promote establishments and businesses on H Street in a friendly challenge,” Laguilles explained. As part of it, there is a 10K run — and the winning running group takes home the H Street Cup. Argonaut Running Club has claimed victory for the last three years. The H Street Runners have their sights set on the prize, though. “We have yet to win it, but we will get them eventually,” H Street Runners’ Winslow said of Argonaut Running Club. Several of H Street’s running groups compete against each other annually at the Capitol Hill Classic as well. Although the groups enjoy some friendly competition, they host their own unique events, too. H Street Runners participants “race” the D.C. Streetcar — the 2.2-mile streetcar line that runs along H Street and Benning Road. Each fall, the group rides the streetcar to the end of the line, and races it back to the top of H Street, Winslow said. Argonaut Running Club holds an informal “H Street Mile” race the day of the H Street Festival. In the morning of the September festival, the roads are closed as vendors set up ahead of the all-day event; so the runners take the opportunity to have a road race on the closed, empty street, Laguilles said. Beer runs, jogs with canine companions and holiday-themed jaunts are also popular activities among the running groups, the leaders said. Members of the Argonaut Running Club. D.C.-area runners hardly ever have to go exercise solo with a surfeit of group-run options. So with so many choices, why should runners opt to join the H Street groups? Many running groups center around specialty running stores, which H Street lacks. So Laguilles advocates for supporting H Street’s businesses and making them a source for running knowledge as well. It’s all about changing tastes, too, he added. “I think running is evolving based on what people want to do after it, and what they want to do socially,” making bars a logical meeting-point, he said. H Street is also an easy jumping off point, Big Board Runners’ Oetman said. It’s not far to run to the National Mall, Navy Yard, Capitol Hill or hop on the Metropolitan Branch Trail. Also, it’s near several quiet side streets and neighborhoods ripe for running. Big Board Runners, H Street Runners and Argonaut Running Club are all free for people to join. The H Street running groups’ sense of camaraderie and inclusiveness is really one of the major draws, Winslow said. 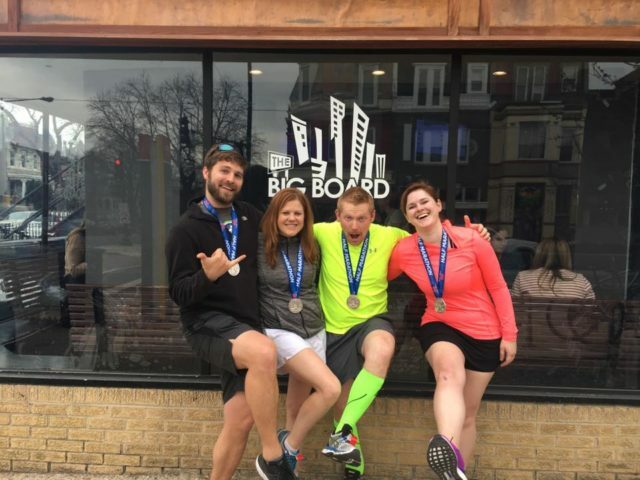 Some of the H Street Runners’ core members may not even call the corridor home, but stay because there are runners of all levels who want to have fun, meet up, exercise and socialize.